This past week I got to see the fruits of my labors…in other words, the first set of exams for the three classes I am teaching. All of the exams in my classes are take-home, which has two particular benefits: (1) I don’t have to decipher students’ handwriting, which can be atrocious at times and (2) I don’t have to deal with extended testing time for those students who have accommodations (which increasingly affects more students). The students also benefit because they don’t leave the classroom shaking their arms in pain from all of the writing (well, only the good students who wrote the entire class period did that). Of course, this also means that there is a greater chance for students to cheat, but it also means that there is no excuse for wrong answers (or incomplete answers). Students have access to the exam questions at least one week in advance of the due date; unfortunately, I think some of them don’t start working on them until the night before (I would say morning of the due date, but they are due when class begins at 8:30 a.m.). Anyway, I am proud to say that I haven’t added any stickers to the Plagiarism Wall of Shame this week (there are a few that are quite similar, but not close enough to warrant filing charges). However, that doesn’t mean they all followed directions; two neglected to staple their exams (which was required, so the pages don’t get separated), and six opted to include the question on their exam (even the part that said “DO NOT INCLUDE THE QUESTION IN YOUR RESPONSE!”). In addition, another three did not heed the warning to cite direct quotations, so they lost points (and, in two cases, did not receive any credit for the 35 point exam question)—and I’m not counting the one who misspelled his name. Plus, a few struggled with my unspoken requirement that they provide me with historically accurate information that will not cause me to burst out in laughter, as shown by the examples below. Andrew Carnegie has to face the challenges of a strike that resulted from many workers losing their jobs. Big Business leaders played a major role in shaping the future economy of America. They developed monopolies out of “lemonade stands” and created infamous businesses. However, it remains to be known whether their business practices were ethical. Before the railroad was ever a notion, the Chinese were busy building the Great Wall. Railroad engineers recognized their important skills and offered to have Chinese workers come to the U.S. on a temporary basis. If it were not for immigrants, we would most likely be British Anglicans sipping on tea instead of a diverse nation buying food from lunch carts. John D. Rockefeller was a Baptist Sunday school who believe that the trend of business were not evil. Andrew Carnegie was a big steel industrial leader who single handedly made steel for the whole country to use for railroad and steel girders for skyscrapers. Ida Tarbell—was a muckraker who was involved heavily in the oil industry. She claimed it was a very dangerous to have worked in one of these industry. She was part of a group of journalist that sought to sell cheap newspapers to show corruption in society. James McParlan—was a secret agent that informed fellow Irishmen of the Pinkerton agency. The Pendleton Act was created in response to the assignation of President Garfield. Ida Tarbell—was a muckraker she was completely against the way Standard oil did things she would say how the company was very dangerous to work on. The Omaha Platform’s goal was to make unions permanent and set in stone as well as the fact that the wealth of people should stay with them if they earn it and not go to anyone else. It stated as well that the land should not be owned by 1 person but only citizens of America can own American land. The other thing that it stated was that transportation be used for the public. The last change worth mentioning is the continuing acceptance of at least some ingrates. Thousands of men risked their lives for a better life and the growth of America. There was the Haymarket Riot which was a lockout at the McCormick plant because of spies. The Cross of Gold Speech was a speech performed by William Jennings Bryan during his campaign for President in 1896. He used this speech throughout his campaign to excite voters who wanted a gold standard in place in the United States. Ida Tarbell new the downs and the hard life of the people who lived less fortunate. Because every nation has criminals and slums and different race people, we have to connect and cope with them to make it a better place. Instead of ignoring and letting them deal with it, people need to help these negative situations by drawing them in and servicing them to make a nation a better place. This opened the eyes of other people like her to help poverty rich nations and people who are in need of help. The Omaha Platform is the idea brought up by the working class people to stop monopolies of trade and let the government control business. Without government control, these people are affected by industrialists who make their own rules about certain aspects of the lives of working class people. Also because they work for everything they have they don’t want some person from out of the country come in to the US and buy land that doesn’t belong to them. This gathered working class people together to get their ideas out about how they feel about this topic. The government played a big rule in the industries in the 19th century. Government started to get evolved with management and labor of the industries. They put acts forth to give jobs to slaves, and to help form unions. Cross of Gold Speech: A speech made to show people that America is fallen into a greedy stage and forgetting all it values. Omaha Platform: Brought on by the populists in Omaha, Nebraska. The point of the Omaha Platform was to maintain the finance, transportation, and land of the people. They wanted the land to be inherited by its people and not by aliens. Sherman Antitrust Act: Prevented conspiracies against labor unions. Preview of coming attractions: Final observation visits for the first student teaching placements begin; the American Revolution begins in History of the American Revolution and History of Pennsylvania; the Roaring ‘20s and the Scopes Trial in U.S. History since 1877. Spring break starts next Saturday (although some of my colleagues will be starting earlier as they participate in their annual pilgrimage to historic sites of Europe, this time traveling to Italy). And now, the photo of the week: Historical marker at the site of Paul Revere’s capture, 19 April 1775. 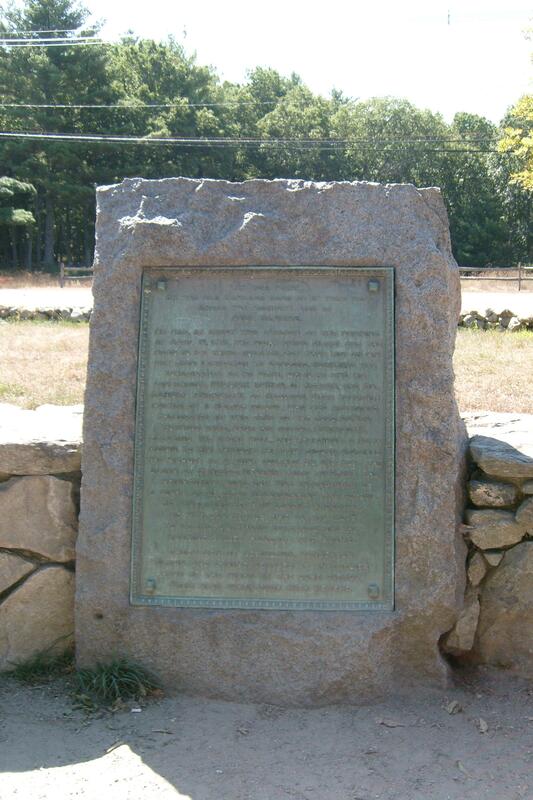 Only in New England do they erect historical markers to honor people who fail to get the job done. Wow, the Ida Tarbell comments made me want to cry, though I must say you had some very interesting and entertaining answers!